Raymond E. ‘Ray’ Brown of Otsego passed away Saturday, May 11, 2013 at his home. Mr. Brown was born April 12, 1932 in Watson Twp., Allegan Co., the son of Leonard and Hazel (Van Houten) Brown. 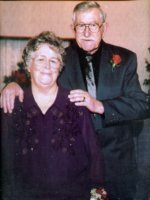 He had worked as a veterinarian assistant for Town & Country Veterinarian Clinic in Allegan, retiring in 2004. Ray also trained harness horses and working with horses was a passion of his. He was a member of the U.S. Trotting Association and Michigan Harness Horse Association and he enjoyed the outdoors, feeding birds, hunting, flower gardening and his dog Maggie. On December 7, 1951, he married the former Marilynn Lacey, who survives. Also surviving are their children, Raymond (Charlene) Brown of Otsego, Leonard (Terri) Brown of Adrian, Edward (Penny) Brown of Otsego, Cindy (Dennis) Burnham of Kalamazoo, Wendy Evans of Gobles, and Robert (Stephanie) Brown of Otsego; 12 grandchildren; 15 great-grandchildren; his siblings, Joyce (Al) Kolbeck, June McEwen, Neva Wallace, Helen Wallace and a sister-in-law, Jean Brown; many nieces, nephews, cousins and extended family members. He was preceded in death by his parents, his stepfather, Bethel Parker, a brother, Bernard Brown, a sister, Jean Blair and a son-in-law, Michael Evans. Friends may meet with the family Thursday, May 16, 2013, from 2-4 and 6-8 P.M. at the Winkel Funeral Home, Otsego, where services will be held Friday, May 17, 2013, at 11:00 A.M., Rev. James Collison officiating. Interment at Hicks Cemetery, Watson Twp. Those desiring may make memorial contributions to At the Master’s Feet/Grief Share or Reverence Home Health and Hospice.